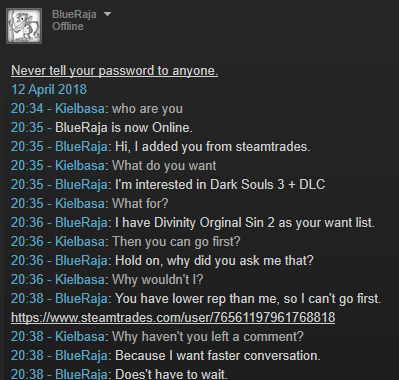 Someone is trying to impersonate you https://steamcommunity.com/id/BlueRaja88/ anyone else should also be aware of this. https://i.imgur.com/rcYK0aI.png here's a log of him trying to scam me. Steam user "DarkTerminator" (https://www.steamtrades.com/user/76561198033967307) impersonated you and attempted to steal several games from me, watch out. Just found some guy using your name trying to trade me. +rep Amazing bot, great service. +Rep I bought some games, Nice Bot! +Rep! Great guy, easy and fast trade! Edit: Still waiting on your feedback - Thanks! +Rep Good prices and fast trading. +rep ty for the trade! Smooth. Good way to trade! Good trade, good prices, fast bot! There were some issues,but his correspondence was Satisfactory,+ rep.